By Keti Kamalani and Michelle Shine, Ph.D.
Two top-level research scientists living in one of the most beautiful places in the world found themselves struggling to be happy. 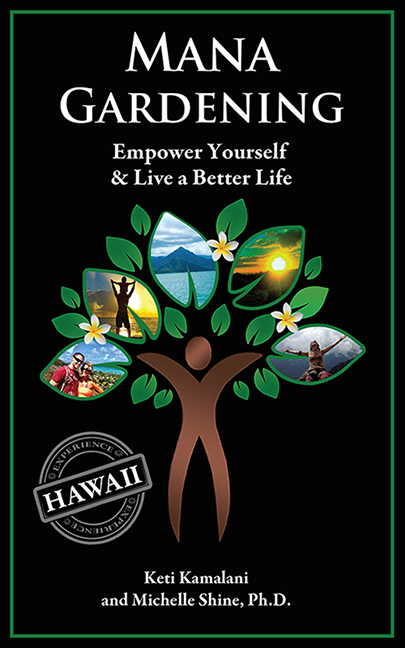 Their search for the essence of true happiness led them to an ancient Hawaiian inner garden concept that empowers the wisdom from within. They call this path Mana Gardening, in honor of the Hawaiian belief in Mana–the spiritual energy, or consciousness that lives within all things. This guide takes you step by step through this unique and relaxing method that empowers you to know clearly and concisely what you want, what you need, and what is your best path forward. Share their insightful journey while exploring a fresh way to establish direct communication with your higher self, your heart and soul. Mana Gardening is a simple yet powerful cognitive-behavioral technique that gives you a simple path to relaxation, personal wisdom, improved intuition, better relationships, a deeper sense of spiritual connection, and true happiness in your every day life! Stop re-living and reacting to past problems, pain, trauma, bad habits or old grievances and start living a better life! Keti Kamalani and Michelle Shine, Ph.D. are medical school-trained cell biologists who have worked and published on the cutting edge of biotechnology. Both are devoted moms, writers, artists and musicians. Kamalani lives in Hawaii and Shine lives in NC. Together they are dedicated to living a better life using the positive life skills available to everyone through Mana Gardening.